Aerial view of the Schkopau chemical complex site in Germany. Officials delivering speech at the groundbreaking ceremony. The majority of the construction work was carried out by companies from in and around Schkopau, Germany. Demand for SSBR increased due to the new European environmental legislation. 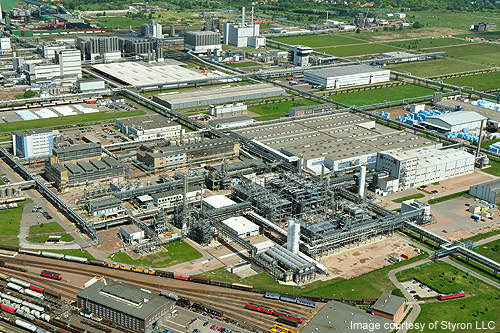 The global materials manufacturing company Styron began the expansion of its solution styrene butadiene rubber (SSBR) plant in Schkopau, Germany, on 11 May 2011 and brought it online in October 2012. The project added a new SSBR production line to the existing facility. SSBR is a synthetic rubber used mainly for the production of high-performance tyres. It gives the tyres a low rolling resistance and better wet grip performance at high speeds. The tyres thereby increase the fuel efficiency and reduce the carbon dioxide emissions. SSBR is also used for various industrial goods, such as conveyor belts, flooring, footwear, belts and adhesives. Expansion increased the SSBR production of the Schkopau site by 50,000t. The additional capacity will now enable the company to meet the increasing demand for high-quality rubber from customers across the globe. 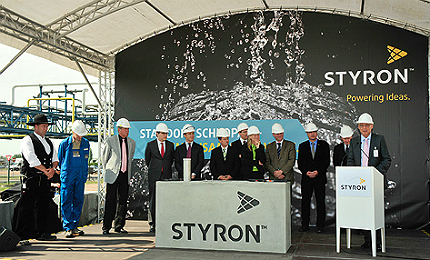 Styron Deutschland employs about 500 people in its Schkopau and Böhlen sites. The expansion project was completed at an estimated cost of $125m and generated about 30 new jobs. "The expansion project was completed at an estimated cost of $125m and generated about 30 new jobs." As part of business restructuring, The Dow Chemical Company sold its Styron Division to Bain Capital Partners for $1.63bn in June 2010. The deal involved divestment of the polystyrene and rubber factories. Styron became an independent, privately held company involved in the production of rubber, latex and plastics. It has full ownership of the production plant, including the production, assets and people. Dow Chemical, however, retains the ownership of Schkopau site and a 7.5% stake in Styron. 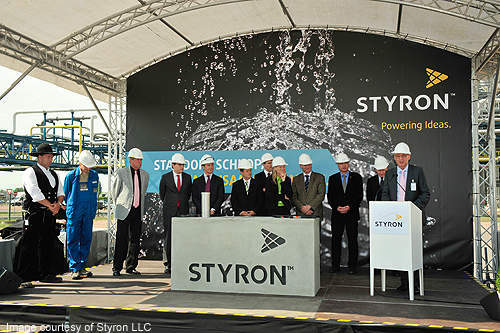 In December 2010, Styron announced its plans to expand the SSBR production at the site. Dow will benefit from the expansion, through various long-term supplies, service and purchase agreements. Dow established its first SSBR production plant in Schkopau in 2002. Construction of the second production line began in June 2007 and was started up in March 2009. "Styron became an independent, privately held company involved in the production of rubber, latex and plastics." The second line has a capacity of 60,000t per year. About 50% of the production (30,000t) is owned by Japan Synthetic Rubber (JSR) Corporation under a capacity right agreement with Styron Europe. Groundbreaking of the expansion project for the addition of third train was held in early May 2011. The new line was built next to the two existing production lines. It increased the production at the site to about 160,000t per year. It produces all the existing oil-extended and clear rubber grades of Styron. The Schkopau site was chosen for the expansion due to the ready availability of logistics support. Dow provided the infrastructure and supplied the additional utilities needed for the expansion. The SSBR Schkopau plant is supplied with styrene and butadiene feedstock from the nearby Böhlen site, which is also operated by Styron. 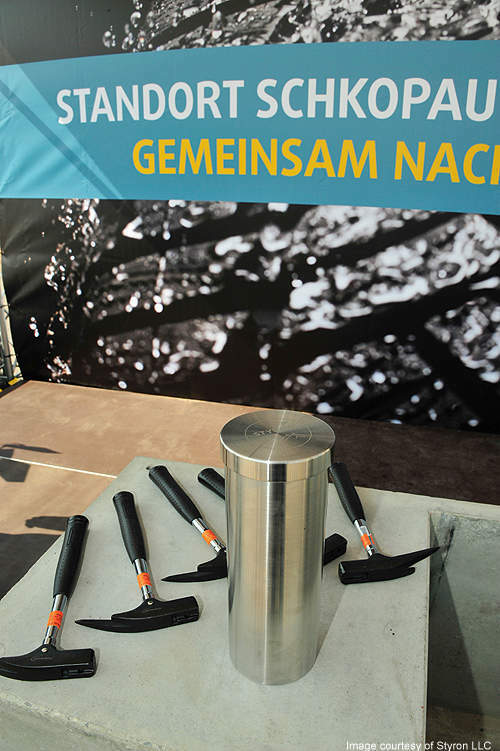 The Böhlen site supplies the plant with reliable and cost-advantageous raw material. SSBR is produced by the anionic batch polymerisation of butadiene and styrene. The process technology involves reaction of the monomers under strong electronegative groups. A batch synthetic rubber copolymer is produced by creating three-dimensional networks, also called polymer chains, in a single reactor. SSBR is also produced in many varieties of vinyl and styrene contents. Demand for SSBR increased due to the new European environmental legislation, which mandated performance labelling of tyres by November 2012. All the cars, buses and trucks sold in EU were labelled with the tyre fuel efficiency, wet grip level and a maximum rolling resistance. The legislation aims to reduce the energy consumption by 20% by 2020. With other countries also expected to mandate high-performance tyres in future, the prospects for growth in demand for SSBR are high. In February 2010, speciality chemicals group Lanxess announced plans to establish a formalin plant at its Krefeld-Uerdingen site in Germany. Construction of the plant commenced in January 2011. The plant was officially opened on 24 April 2012. Hi-Bis broke ground for a second special bisphenol plant in October 2012 at the chemical industry centre of Bitterfeld in the eastern part of Germany. The new plant is being constructed with an investment of €50m ($64m) and is expected to start operations in 2014.